The next session of Billedvev: Norwegian Tapestry Techniques at the Vesterheim Norwegian-American Museum has been scheduled for September 12-15, 2019, although sign-up is not yet available. There will also be a session at the Weavers Guild of Minnesota beginning on January 18 (more information and sign-up). The first workshop was held in September 2017. See: “Billedvev Workshop at Vesterheim. Read about the 2018 workshops here and here. Billedvev translates as picture-weaving, and medieval Norwegian tapestries have a distinctive charm and graphic appeal. In this workshop, learn about the techniques used in historical Norwegian tapestry, particularly the decorative joins where colors come together. You will use the expressive joining techniques to weave a sampler or image of your choice. In addition to intensive weaving, the workshop will include slide-based lectures, in which we will follow the thread of Norwegian tapestry techniques as practiced by weavers from medieval times to the present. We will discuss the images and symbols found in old tapestries. 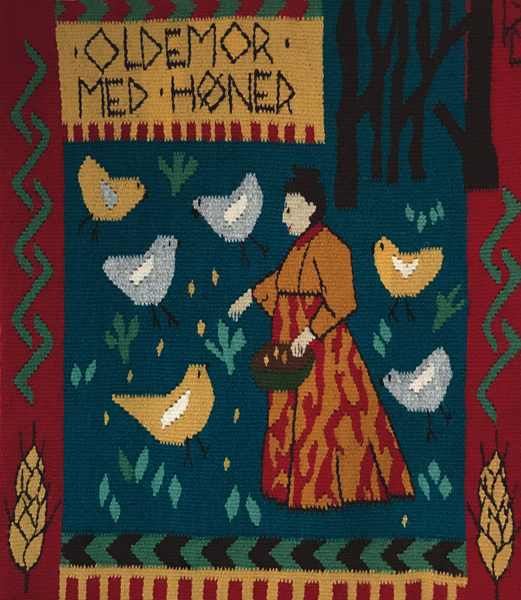 The piece shown here is not the class project; it is a billedvev-inspired tapestry of my great-grandmother with chickens. Equipment: Students provide their own warped tapestry looms (or borrow one from the instructor). Supply Fee: $15 for printed materials.